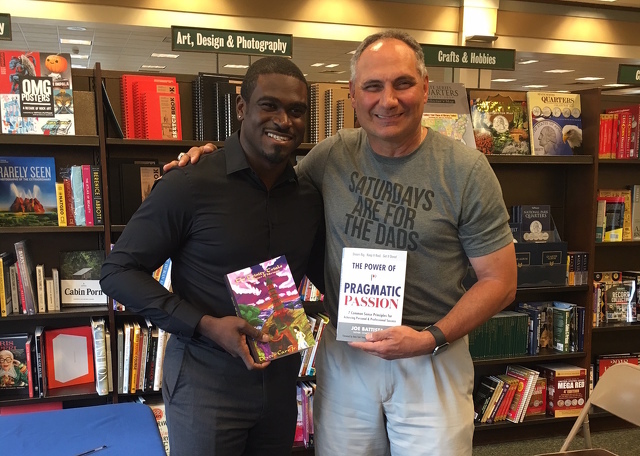 Joe Battista, right, with fellow Penn State alumnus and author Dexter Carr Jr.
Have you ever had that incredibly exciting feeling for the completion of something that you have worked on for a long time? Something that you put your heart and soul into that is so close, that you could almost taste it? Well, the book I started a couple years ago, stopped to start a job, and then started again, is now so close to being finished that I can just about taste it. I have actually held a printed proof of “The Power of Pragmatic Passion” in my hands, which is an absolutely amazing feeling. Alas, there were enough small changes that needed to be made that I decided to return the proof one last time. So while I know that all of my loyal fans (that would include some, but not all, of my immediate family and a few close friends) are waiting with bated breath, I am still a week away from being able to offer it for sale on Amazon and through my website. Well, let’s hope that’s not going to be the case for those who are looking to be inspired. While a story about Ryan’s school and career anxieties is featured in the book, I had little success in getting him to help me review it. In fact, I had little success in getting any of my own kids’ input, so I relied more on other high school and college students of friends, people I knew in the workforce, recent retirees and on my own research. Writing a book is not easy. I spent many hours during my writing and research in Pattee Library (actually a lot more than I ever spent as a student), in the Mateer Building, at Innovation Park, and at the Barnes and Noble at the Penn State bookstore and on the Benner Pike. I utilized interns from the Bellisario College of Communications and several friends and colleagues throughout Penn State. I have no grand illusions about this book becoming a best-seller or allowing me to sail off into the sunset. I wrote it as a calling, as a passion with a purpose. I wrote it to help young people make better decisions with their lives. To give those people who are going through career crisis something to think about before they fall prey to the “just do it” mentality and up and quit their jobs. I wanted to be able to give recent retirees some food for thought before they decide what’s next in their life’s journey. I hope the book will achieve that objective by inspiring people to ask themselves deeper questions and to be motivated to create the positive change in their lives that so many seem to be seeking. All this comes back to having what I call a “pragmatic passion” toward life and career going forward. Pragmatic is the common sense approach while passion is having an intense enthusiasm for something or some purpose. Together it’s about making decisions from your heart and your head. It is about avoiding falling victim to the generic advice to “just follow your passions” or to just “go after your dreams” and to “just jump” without really thinking about the consequences of your decision and the sacrifices necessary to achieve success. I want readers to think of it as an inspirational guide with the safety switch built in so that before you “just go for it,” you will have done your due diligence. Dream big. Keep it real. Get it done. I recently saw a feature on the news that talked about how some of today’s young couples plan to work for a few years, quit their jobs, go travel around the world for a year, and then go back to work when they need to and repeat this cycle over and over. That takes a lot of courage, and while it would certainly be an adventurous life outside the “sea of sameness,” it won’t work for everyone. I also recently heard a very popular video blogger tell a female 30-something that was miserable at work that she should just walk into the office on Friday and quit her job because it’s just not fun to her. Whoa, not so fast, as it might be time for common sense to kick in. While these alternative approaches to careers may work for some, they are certainly not for everyone. It really does depend on your stage of life, your desired quality of life, and who else is dependent on you. For example, what if the young lady mentioned above has kids, a mortgage and school loans. What if someone going through a mid-life crisis has kids about to go off to college and elderly parents to assist? For the young couple above that wants to repeat the “work a couple years and then travel” approach, have they considered the ramifications on their retirement savings and setting aside money for a home and for kids? Not everyone can afford to do this. If you knew you were getting a large inheritance or you have built a reasonable nest egg, then certainly your options are greater than most. The sad state of affairs of most Americans’ checking accounts and retirement savings leads me to believe this “work a few years take a few years off plan” is rife with peril. So is taking advice from some Internet motivational speaker who has no idea what your unique, individual circumstances and needs might be. Recently, I’ve had the chance to work with a number of young people in high school and in college locally, in the state, and out of state. I also had the honor of being the Keynote Speaker at the Smeal College of Business Online MBA in-residence week dinner at the Penn Stater last week. Getting a chance to talk to so many enthusiastic MBA candidates and having the chance to inspire them to find their own Pragmatic Passions was exhilarating and fulfilling for me. I just love being in a room surrounded by people who are a lot smarter than me! 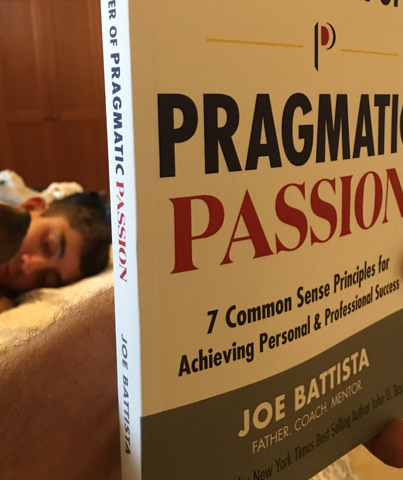 The overall reception that I have received for the Pragmatic Passion program so far has been very encouraging. The reason I believe deep down in my heart that it will be successful and help change people’s lives for the better is because it is a calling for me. I am not looking to become the next Mel Robbins or John Maxwell. I just want to be myself and be able to help others to the best of my ability. After a number of years attempting to be an administrator, a job at which I was mediocre at best, I am back in the coaching and instructional world where I have re-discovered a pragmatic passion with a purpose. Writing a book became a part of the passion and purpose. Well, it was not easy! The amount of self-doubt about sharing your thoughts to the world is a bit daunting. But it was also a heck of a lot of fun. The book is not perfect and not everyone will like it or agree with my thoughts. It is my intention to get people talking, to think about developing good options and making informed choices, and then putting into action their goals to achieve personal and professional success. This past weekend I went to meet with the managers at Barnes and Noble on the Benner Pike. While I was there I met fellow Penn State alumnus, Dexter Carr Jr., who was doing a book signing for his new fantasy novel, “The Trinity Trials.” His first volume is called “The Tower of Nirvana.” I got a chance to meet his very proud parents and to talk with them all about what it’s like to be a new author. I don’t think Dexter has any unrealistic expectations either about where this author’s journey might take him. But to see the joy in his face and in his voice, and the thrill that his parents have for seeing their son achieve his dream, was inspiring to me. Dexter is a senior healthcare consultant in the Washington, D.C. area and while he enjoys his vocation, his passion for writing and storytelling is his true joy. One becomes the means for the other. I really appreciate that StateCollege.com publisher Dan Myers and editor Geoff Rushton (and editors before him) have allowed me the opportunity to practice my craft here on these pages. It is also pretty cool that my book came together just before the fifth anniversary of the opening of Pegula Ice Arena. Helping to secure the Pegula gift, being an integral part of the design and construction of the facility, and to be able to help with the transition of the hockey programs to NCAA status, was a dream come true for me, and many others, with a passion for hockey. The story of my own dream coming true is in chapter 8. Dream big. Keep it real. Get it done. The book really is so close I can taste it. I hope others will enjoy its flavor right along with me. Consumed on all sorts of occasions, from birthdays to break-ups, ice cream has long been associated with not the most healthiest of indulgences. 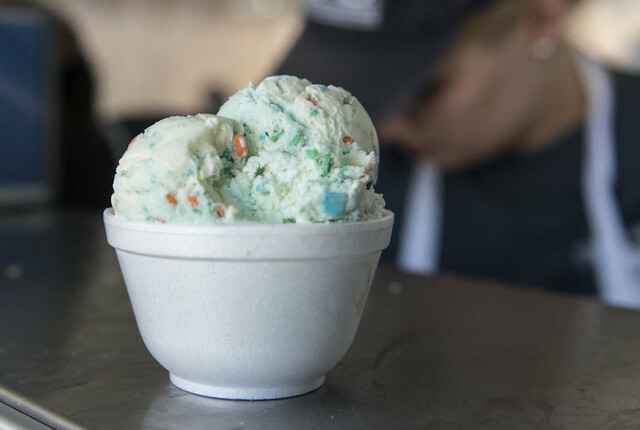 Despite its high caloric value, ice cream will always be a part of American culture, and particularly a part of University tradition with the Penn State Berkey Creamery being a historic landmark on campus.